Essar Foundation is the Corporate Social Responsibility (CSR) arm of Essar committed to maintaining the highest standards of CSR in its business activities and aims to make a difference to the communities around its area of operations. 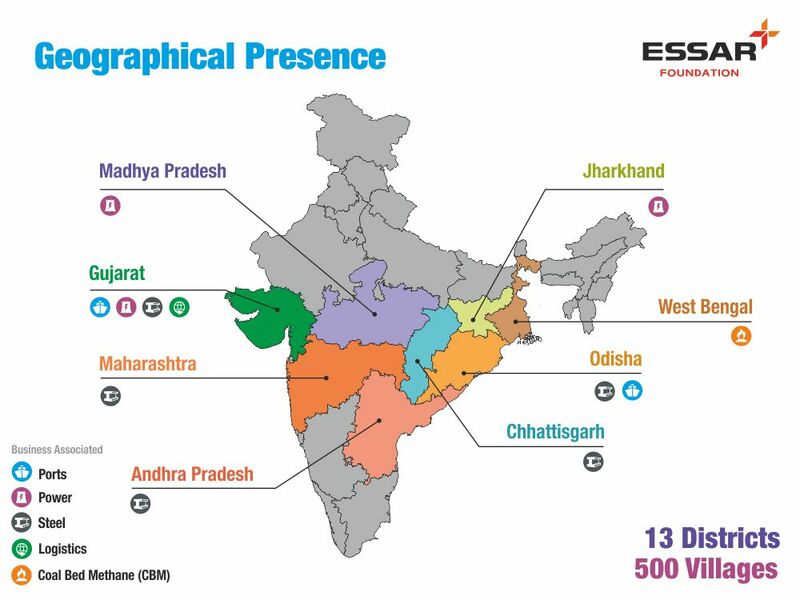 Essar Foundation collaborates with key stakeholders, especially the local administration and institutions, to facilitate development with initiatives in education, livelihoods, women’s empowerment and health. The interventions are in line with the UN Millennium Development Goals and the provisions under the Companies Act, 2013. It impacts more than a million lives positively across 500 villages in eight states of India. The spirit of Essar Foundation stands for hope, change and growth for the people who work with us and the people we work for. We, at Essar, have a mature outlook about our role in society, and we firmly believe that adopting responsible practices and processes can make all the difference in the long run. Our teams working in eight states and 12 districts of India strive relentlessly in evolving relationships with communities, while taking the remoteness of locations, challenging circumstances and adverse local conditions in their stride. Whether it is about delivering healthcare beyond the rivers in Malkangiri in Odisha or about making the youth employable in the remote hinterlands of Chhattisgarh, our team is diligently breaking ground to make a difference that is felt. Staying true to the Essar vision , people are at the core of all that we do and strive for. Touching people’s lives positively with an ingrained sense of respect to their realities and aspirations lies at the core of our approach. Our belief is in evolving organic relationships with all stakeholders and in partnering actively towards development. Such relationships are built upon the synergy through responsible partnerships and collaboration–whether it is with the local government, community institutions, or civil society organisations. The initiatives are strategically designed on the basis of community needs assessment, mapping, participatory planning and considering local feasibility. In all locations, the local government’s efforts in development is supplemented with the Foundation’s resources and facilitation. The initiatives also provide for rich experiences for Essarites by way of their contribution through employee volunteering. The endeavour is also for the communities to own the initiatives and sustaining the impact over time.